The Stream is no newcomer to this blog. In fact this is the band's third album that is reviewed on these pages. The Leiden based band around Jan Stroomer scored positive reviews so far, so with a new cd up for release my ears are in place for a favourable reception of Sweet Sally Sad Departure. The first impression is that of the cover art. The contrast between the clear lower arm and hand and the hazy background, with the figure of a woman. Caught dancing? Or seriously hurt, just before falling over backwards? Putting on a wedding dress while striking a serious pose? It could be a lot of things. Intriguing and slightly mysterious the cover art is. That is not all. 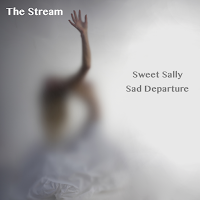 The way the album title is positioned suggests a dichotomy between 'Sweet Sally' and 'Sad Departure'. The album begins with an instrumental piece. Of course Jan Stroomer's piano plays the centre role in 'Sally's Overture'. It starts out with a violin before a busily played piano, in the dark note segment, joins both violins. The style of playing reminds me of that most bombastic of piano driven rocksongs: 'Worn Down Piano' by Mark & Clark Band. By adding more instruments, a rocksegment and a choir it truly becomes an overture. So is there a rock opera in the making here for me to listen to? The answer to this question is a plain yes. The Stream tells a story about the end of a relationship and all the denial, the hurt and the anger and the mourning that comes with it. Sweet Sally Sad Departure takes the listener to all different phases. In the mean time no instrument goes untouched to underscore the mood. Just listen what comes by in the Overture. I do not think I have ever written this before, but if anything the music reminds me of Ekseption's first album. Then add some violins and female harmony singing. Things go quiet and the piano picks up the theme, before Jan Stroomer starts singing. With a minimum of effects The Stream sets the scene and the mood. Someone is leaving, shuts a door firmly and goes off to a bed, alone. Musically I am being set back years to 'Days Of Future Past' by Moody Blues for example and symphonic rock of the 70s and 80s with hints of Randy Newman and U.S. late 70s pop like Rupert Holmes. Later on in 'Sally' I find Joe Jackson from around 1982 can be so easily mixed with Pink Floyd from 1973. "I don't care", if it is done in such a beautiful way. That is just the beginning of the musical story of Sweet Sally Sad Departure. Songs hold some irony like 'The Goddamned Truth'. With its 50s piano playing it brings to mind all the things Queen dared to do on its (symphonic) rock albums of the 70s. The change in the song to a more dreamlike sequence shows the ambition The Stream has on its new album. And it is working to. A lot of small pieces are falling right into the place they belong. Creating something utterly new along the way. Expect mood changes by the song. Not just another song but another beast entirely, another point of view to the story, another referencing point a song starts with. There are a million influences in the tiniest details of Sweet Sally Sad Departure to be found. What it all adds up to is an adventure in music The Stream leads the listener through. Those details can be an instrument that joins a song for a short while, the little lady harmonies that join in. Certainly a great feature of Sweet Sally Sad Departure. Each individual one is like a little light switched on to accentuate a detail of a whole for a short while. All the changes also shows how many genres The Stream as a band is able to handle successfully. Without losing the inner coherence of the album. That again is due to those fine details already mentioned that make sure there is continuity in the whole. In 'Sally' the circle is rounded. The tune from 'Overture' returns turning the song that is already a true hybrid into a piano rock anthem of quite some proportions. The late night jazzy outing 'This Life Is Killing Me' ends the album. "It's time for closure" indeed. Not before another fine song comes by though. A song full of resignation and grasping the truth. The beginning of something new, the storyteller can not see approaching around the corner yet. Selfpity is winning, still, but it won't be long for the first ray of sunlight to reach the late night jazz bar and life in general. Sweet Sally Sad Departure is alight and alive with ambition. Much more so than on the previous two albums I reviewed, 'MMXV' and 'Art Nouveau'. The result is the finest album by The Stream to date. Again the band sets a step forward and is rewarded with a fine result. On 12 April Sweet Sally Sad Departure gets its cd presentation at Scheltema's in Leiden. I am looking forward to listen and see the work performed. Stay tuned!